Esri received the 2011 Jane Goodall Global Leadership Award for Excellence in Conservation Science for its decades of work supporting conservation, sustainability, and related education. Esri president Jack Dangermond accepted the award on September 24 during the Jane Goodall Institute (JGI) program, A Conversation with Jane Goodall, held in Hollywood, California. The evening's festivities commemorated Goodall's extraordinary accomplishments over the past 51 years while honoring the work and achievements of individuals and organizations that embody the institute's mission by taking informed and compassionate action on behalf of all living things. The event marked the fifth annual presentation of the Jane Goodall Global Leadership Awards—but this year was the first time world-renowned conservationist and primatologist Goodall presented an award for excellence in conservation science. 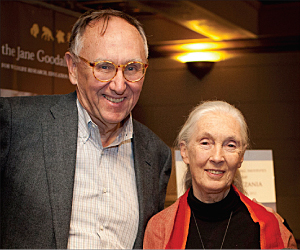 Jack Dangermond and Jane Goodall. "You and I are living in a world where we're going to have to move from simply conserving places to actually being proactive and creating healthy places," Dangermond said to the audience upon accepting the award from Goodall. "What has inspired me about Jane's work is that she is sensitive to not only listening in the forest but also to villagers and leaders and bringing them together to come up with future visions. I'm very committed to helping you, Jane." The Jane Goodall Global Leadership Award for Excellence in Conservation Science recognizes companies or organizations dedicated to developing innovative research and technology to protect and restore the natural world and improve the well-being of all who live in it. "Esri's innovative research and GIS technology for land use, sustainable development, wildlife preservation, and humanitarian relief is worthy of the highest acclaim," says Dr. Lilian Pintea, JGI's vice president of conservation science. "Building on Dr. Goodall's groundbreaking research, science is the core of JGI's work. Thanks to Esri's technical assistance and support over the years, Esri's GIS software and data have been used in numerous JGI programs." JGI's efforts in Africa, aided by the use of GIS, include helping 21 communities better manage their land in Tanzania through participatory village land-use planning, working to expand the Tchimpounga Natural Reserve in the Republic of Congo, and developing a conservation plan in the eastern part of the Democratic Republic of the Congo to protect 35,000 chimpanzees and 4,000 Grauer gorillas. More than 5,000 nongovernmental organizations use Esri software in their work to create a more sustainable planet. Esri's activities also include donating GIS software to conservation organizations around the world; training hundreds of conservationists to use GIS software; providing a free mapping service for data, as well as maps and applications valuable for environment, habitat, and species analysis; and hosting the Society for Conservation GIS. Founded in 1977, JGI continues Goodall's pioneering research on chimpanzee behavior—research that transformed scientific perceptions of the relationship between humans and animals. Today, the institute is a global leader in the effort to protect chimpanzees and their habitats. It is also widely recognized for establishing innovative community-centered conservation and development programs in Africa and Jane Goodall's Roots & Shoots, the global environmental and humanitarian youth program, which has groups in more than 120 countries. For more information, visit www.janegoodall.org.